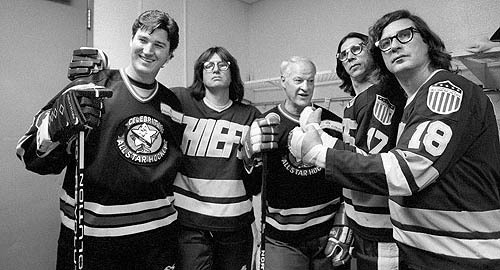 ESPN is running a very cool segment on Peters Twp's Christian Hanson, current Notre Dame hockey player and son of Slapshot star Dave Hanson (shown below with a few other famous hockey players). Good catch, Mondesi. I saw the SC clip and meant to mention it in my column. This makes up for my lack of Hockey You Tube of the Week this week.